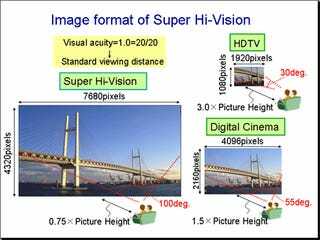 You may recall that last May I told you about Super Hi-Vision, the next-generation in high def that promises an insane resolution of 7680x4320, or 16 times the resolution of HDTV. It turns out that it much be a little too high-def; it's so realistic it might just make you sick. Yes, fast moving images at that resolution will probably cause motion sickness according to the eggheads at Japan's NHK who are developing the technology. Adding to the practical issues the format will face is that there's no real way to cram that many lines of resolution into a display any smaller than 60 inches, and even if you could cram them into a smaller screen there'd be no point to it. You wouldn't be able to tell the difference anyways at that point.